Have you heard of the hair brush that straightens your hair? No, I’m not talking any ordinary hair brush – but a hair straightening brush. Although similar to a flat iron, they work in a different way. Straightening brushes seem to be muscling in quite successfully on the hair styling market, with more and more models being released. Each appliance type has pros and cons and which one you get will more than likely depend on your hair type, budget and hair styling habits. I personally use both straightening brushes and flat irons (just call me greedy) and have different uses for each, depending on how much time I have or what my hair is looking like. I like my irons for super straight hair and my brush for a more natural straight look. If you are interested in the low down on flat irons (like ghd, cloud 9) head on over to my straightening guide. They are priced significantly cheaper than the high end hair straighteners, but are they any good? I decided to dive into the specs and reviews of every hair straightener brush I could track down. There are many for sale, some better than others. TIP: There are plenty of cheap models available for sale – cheap doesn’t always have to equal bad, but do your research and read reviews before purchasing! You can also see which straightening brush I ended up buying, using and loving! Essentially they are a heated hair brush. They plug in like a usual hair straightener does. They tend to have a variable temperature so you can adjust according to your hair type. Are they better than hair straighteners? They work on all hair types but I think they are definitely more effective to those with finer hair. Having said that, they do work on thick hair, but may take a little longer to be effective. They are very versatile and you can easily use them to curl and style your hair. As with hair straighteners, make sure you choose a hair straightening brush that is made with ceramic so that you minimise potential damage to hair. They are not designed to be used on wet hair. Make sure your hair is completely dry first. They are potentially more portable than a regular hair straightener so can be taken on holiday with more ease. Just check they are dual voltage. Hair straightening brushes will give you a more natural look. You are able to create curls and a bit more volume than traditional flat irons. In comparison to hair straighteners they are very new to the hair and beauty market. I think given time these will become the more popular choice when choosing what to buy to effectively straighten your hair. Especially if the prices stay so low. AsaVea have recently released this brush, a beautiful and stylish brush that really delivers. I think it’s really upped the quality and effectiveness and set the bar high for the competition. This model is my favourite by far and so has won the top pick slot. It is also the straightening brush I ended up buying. Read on to find out why it deserves such a title. Beautifully packaged including a carry pouch – making it the perfect gift! The straighteners arrived in a lovely luxurious looking box. Perfect for a gift for others or for yourself (thanks me!) Aside from the straightening brush itself (which is a beautiful pinky gold colour), there is a bag to store it in, or to take travelling with you. There is also a cleaning brush and a basic instruction booklet. As I mentioned before, the brush itself looks good. I love the colour. It is lightweight and easy to hold. The booklet explains how the brush works and what buttons to press and when.To switch the brush on you simply push and hold the On/Off button. The LCD display will show the default temperature of 355F (180C). You can switch between Fahrenheit and Celsius by pressing the ‘+’ and ‘-‘ button at the same time. There is an Auto Lock function to keep the temperature locked in when you are using it. To unlock it (which you will need to do to adjust the temperature) you push the On/Off Button twice to unlock. The temperature levels are changed by using the ‘+’ and ‘-‘ buttons, going up or down in 20F/10C increments. As I have thick (and rather unruly) hair I increased the temperature all the way up to the maximum of 450F/210C. It took a few minutes to reach the desired temperature (the LCD display stopped flashing when it was ready). I needed to section out my hair (as I do with my flat irons). My hair had been left to dry naturally after I washed it. Side Note: Don’t ever use the brush on wet hair. As I began to straighten my hair it felt initially quite strange. I am really used to my ghds and holding them and a brush to do my hair. It didn’t take too long to get used to them but I did find myself feeling the need for a glove to protect my empty hand that kept on wanting to get involved! The end result? I really liked it. My hair wasn’t as dead straight as my ghds get it, but I really like the straight but more natural looking straight hair it achieved. Since I’ve had them, I have used them frequently. I like the different look they give me. PROS: Quality product suitable for all hair types. Easy to use. Looks great. Adjustable temperature settings. CONS: Need to buy a separate glove and heat protector mat. Takes longer to heat up than my ghds. The Head Kandy Straightening Brush is a popular brush, the anti-snag design ensures minimum discomfort as does the enhanced bristle design. The brush acts as a detangling brush and head massager as well as a straightener. There are adjustable heat settings up to 450°F, so you can decide how hot you want it to be. This will depend on your hair type – the thicker your hair the hotter you should have it, the finer or more delicate your hair, the lower the heat setting should be. 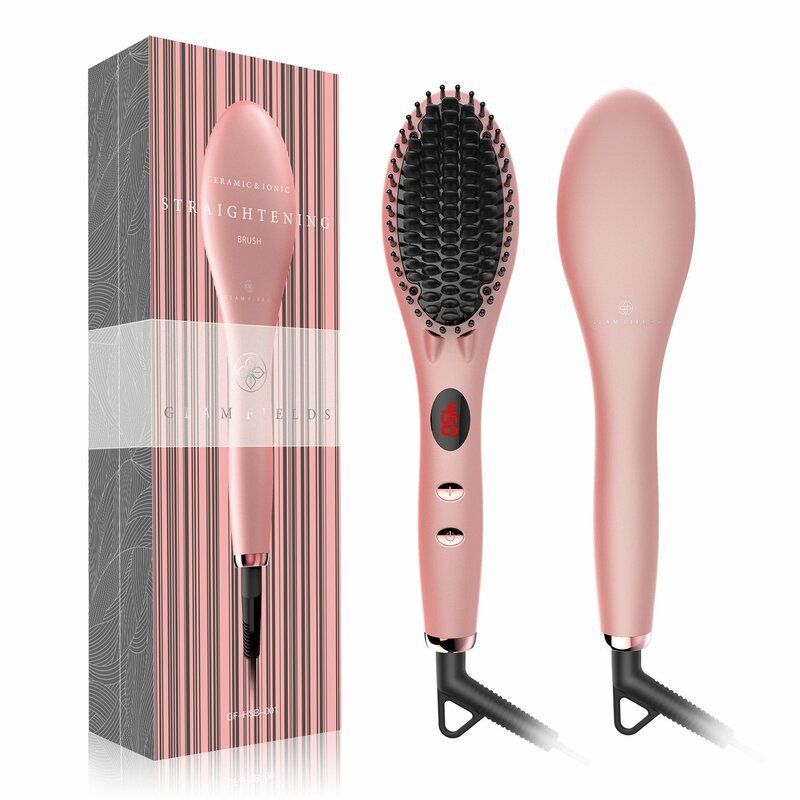 This brush is suitable on all hair types; the heated ceramic fins alongside the flexible bristles help to control your hair as you heat and brush at the same time. It is recommended to first brush the bottom of your section of hair and then go over the outside to enhance smoothness. This tip definitely helps, when I brushed the inner side I instantly felt how straight my hair was but I was a little disappointed in the lack of smoothness – but the second brush just really set everything in place. Something I really loved about this is that although it recommends working in sections, I felt like I could still get a really thorough job just by brushing through my hair with it. Just treating it like your regular hairbrush can give you really quick flawless results. 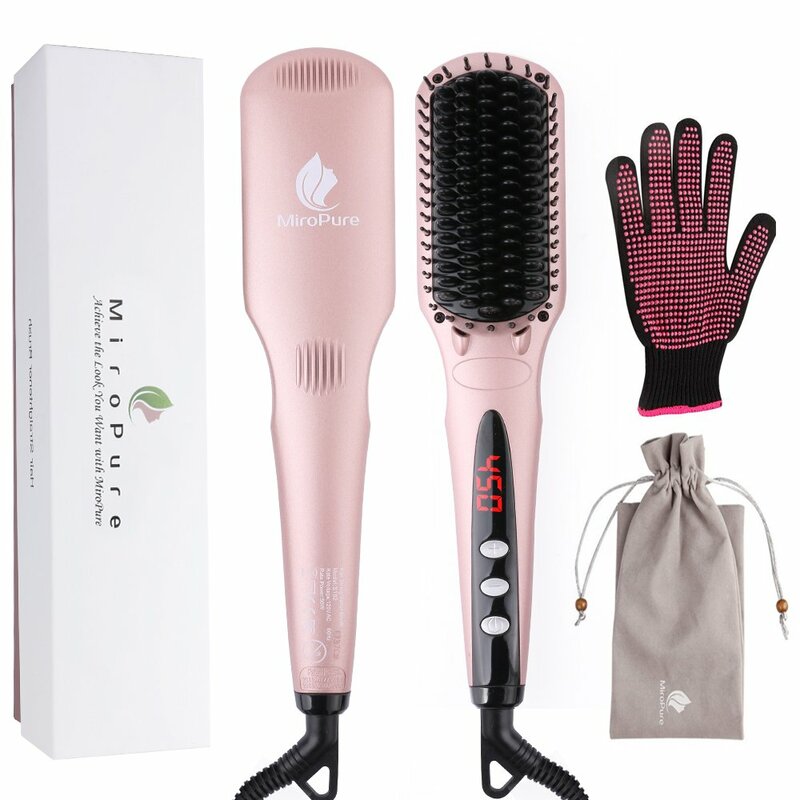 It’s also amazing that this comes with a heat glove which is super convenient, but also very necessary as this does tend to heat my hair up really dramatically – so much so that I can feel a bit of the heat even through a glove! BearMoo are not a brand that’s well known or recognised in the world of hair tools, but their take on the straightener brush is definitely commendable. Let’s see how they fared amongst this list of brushes. This is definitely an impressive release considering how little we hear of the brand BearMoo. The brush works well in terms of heating up really fast, and it definitely gives you amazing results- results comparable to the rest of the list. Something that is particularly amazing about this brush is such a wide range of heat settings; this makes it one of the best when it comes to personalizing the brush to your needs. Whether you hair finer or thicker hair or want a more natural or pin-straight finish; the different heat settings can really help you get a versatile range of finishes. While this isn’t as insanely smoothing as the rest, it does actually work really well to tame frizziness. You might not get shiny and sleek hair but for those with finer hair that is already sleek, this could work amazingly to avoid giving your hair a greasy look and it can avoid really emphasizing how fine your hair might be. Another brand appears to have delved into the world of hair straightening brushes. You can often find when it comes to straightening brushes that there are a lot of unknown and more affordable brands- it started off that way anyway and then the more well-known brands began to dabble in them. So it’s definitely nothing to steer away from, you may find the less-known brand actually works better! Let’s see if that’s the case here. Safety controls: fully rotatable wire, LED screen displays temperature, automatically shut-off after 30 minutes. The DAFNI Hair Straightening Brush has grown to be the most famous when it comes to hair tools. This unassuming little brush has even earned itself a spot in the Daily Mail. So what is it about this brush that warrants so much chatter? 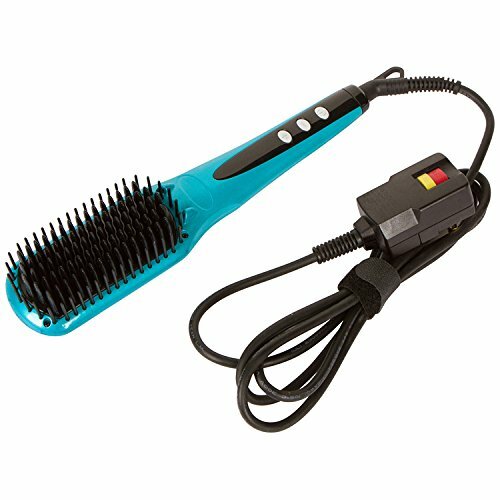 This is the first release of a hair straightening brush, and though many have followed it, this brush was the first. Actually, not this exact one as this is the travel version, and in our opinion, better than the original. It is surprising how well the electric brush works considering that its maximum temperature is 185C while the rest go all the way up to 230C, but somehow the technology behind this works. You can complete your entire hair within minutes and still have a salon quality finish with the added benefit of not damaging your hair. 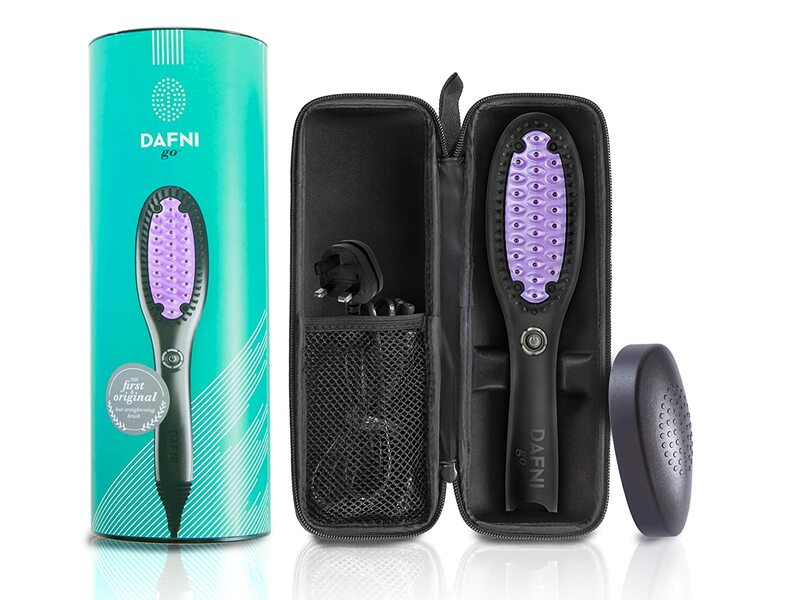 The DAFNI brush is perfect if you’re looking to save on time. 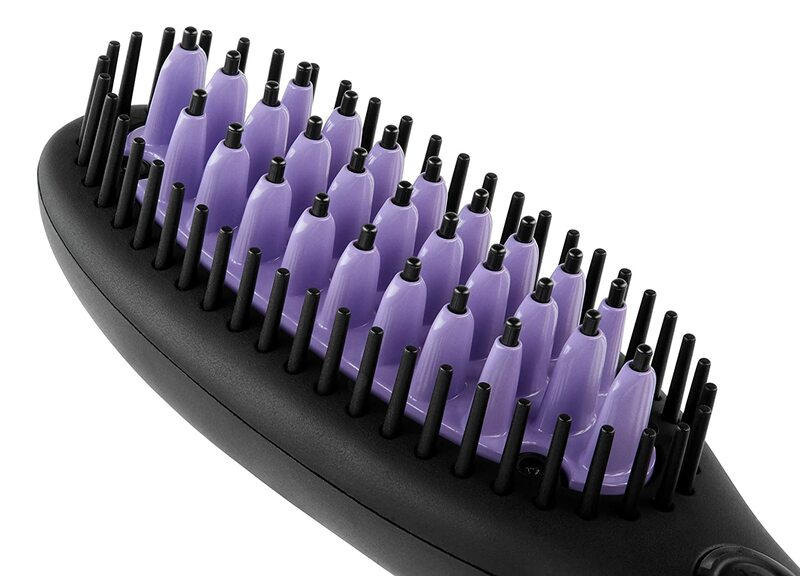 The technology behind the bristles is guaranteed to give you perfectly straightened hair super quickly. This brush is perfect for a more natural looking finish, instead of pin straight hair it will give you hair that looks naturally straight, with a bit more body to it. It seriously helps with frizz and can help with any static you may suffer with. It’s especially amazing at getting to the back of your head, you can easily tame everything down with just a few brushes and not worry about burning your scalp. What’s so amazing about this is that the heat protecting quality gives you the results of a straightener whilst avoiding the damage. Aside from hair types, this is perfect for convenience. The travel size makes it easier to (obviously) travel with, especially thanks to the safety of the thermal travel case and travel cover. But also for more day-to-day needs such as going to the gym- the size of this makes it perfect to carry around with you anywhere without the hassle with most large hair straighteners. What’s most impressive about this is that despite its smaller size, this still works identically to the original. It has the same features and gives you the same efficiency and smoothness, you just get to use it on the go. The 2 in 1 Ionic Straightener utilises both MTC Heating and Ionic Technology to provide a popular and highly rated hair straightening brush. The Metal Ceramic Heater technology means that the straightener heats up quickly (less than 1 minute). The Ionic technology helps to reduce frizz and increase the gloss by sealing the hair cuticle. Each of these brushes ticks lots of boxes and have very positive reviews. If you are after a more natural looking straight hairstyle as opposed to poker straight hair, these brushes are what you should buy. My one recommendation would be to purchase a heat resistant mat as well to protect your surfaces when placing it down after use. So which of these should you go for? They all have great reviews and have similar features. However, the AsaVea brand just about wins it for me, and indeed did as I ended up buying it. 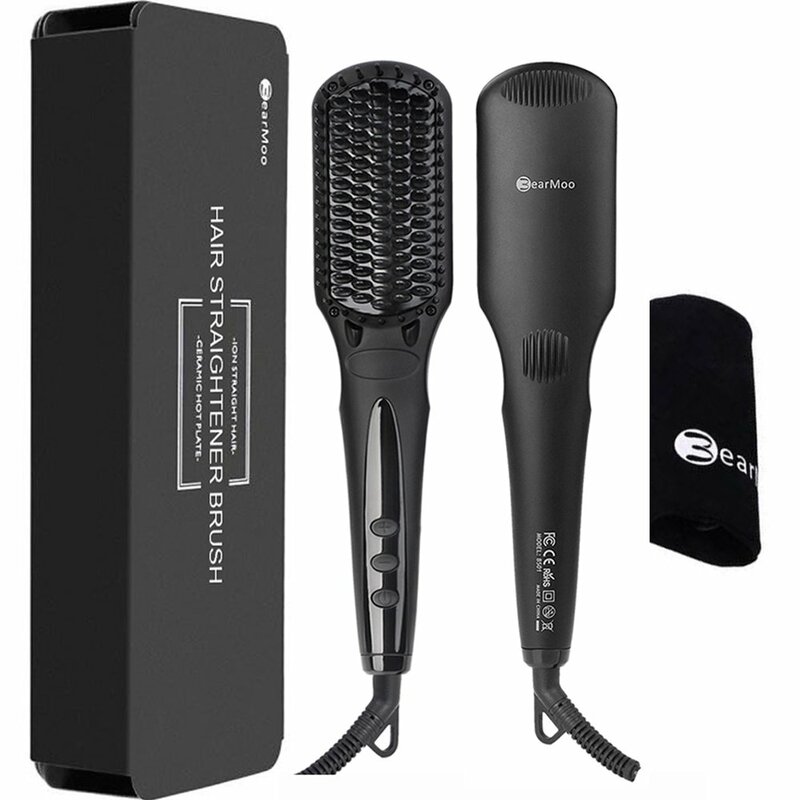 It is lightweight, small, has variable temperature settings for all hair types and comes with a travel case. Get the best out of your brush and enjoy lovely straight hair. Either let your hair dry naturally or use a hair dryer to dry it off. Make sure your hair is free of any tangles. If you have just dried it using a hair dryer it should be – but you may be using the heated straightening brush first without washing your hair first (which is perfectly ok), so make sure you have brushed it through with your usual hair brush. If you have thick or medium to long hair I would recommend sectioning out your hair. Just use hair bands or any clips you might have. Once the straightening brush is heated up and ready to use, start brushing underneath the hair section, starting as close to the roots as you can. If you have a heat glove (not all brushes come with one so you may need to buy one separately) use your other hand to pull your hair taut so that the brush can get through the hair. Gently pull the brush down your hair until it reaches the end. Continue to do this until your hair is as straight as you want it to be. Shape your hair at the bottom by curling the brush under, as you would with a normal brush when blow drying. You may want to run the brush over the top of your hair too to smooth away any waves. As with the flat irons, make sure you take care when straightening. Try and use a heat glove so you can protect your other hand and don’t get too close to your scalp – you don’t want to go burning that! Once you have worked your way through each section and are happy with the results you might want to use a serum or spray to hold it in place for longer. Once the brush has completely cooled down you can use a damp cloth to wipe away any product residue and remove any hair from the brush.